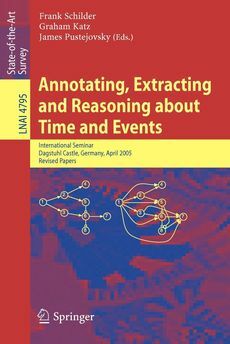 This state-of-the-art survey comprises a selection of the material presented at the International Dagstuhl Seminar on Annotating, Extracting and Reasoning about Time and Events, held in Dagstuhl Castle, Germany, in April 2005. The seminar centered around an emerging de facto standard for time and event annotation: TimeML. It features nine papers that detail current research and discuss open problems concerning annotation, temporal reasoning, and event identification. Schilder, F., G. Katz, and Pustejovsky, James, ed. Annotating, Extracting, and Reasoning about Time and Event. Berlin: Springer, 2007.